A place so renowned that it boasts not one, but three nicknames, Bologna is Italy’s juiciest city. Known fondly as La Grassa, the fat one, La Rossa, the red one and La Dotta, the learned one, Bologna boasts three distinct characters. In fact, so diverse are these personalities, it can often be difficult to know where to begin when deciding what to see in Bologna. Occupying prime position on my city break bucket list for several years now, I decided to visit Bologna as part of my 32nd birthday celebrations. My tastebuds now mature enough to appreciate the onslaught of delicious cheese, wine and local dishes that awaited, Bologna was well worth my wait to maturity. 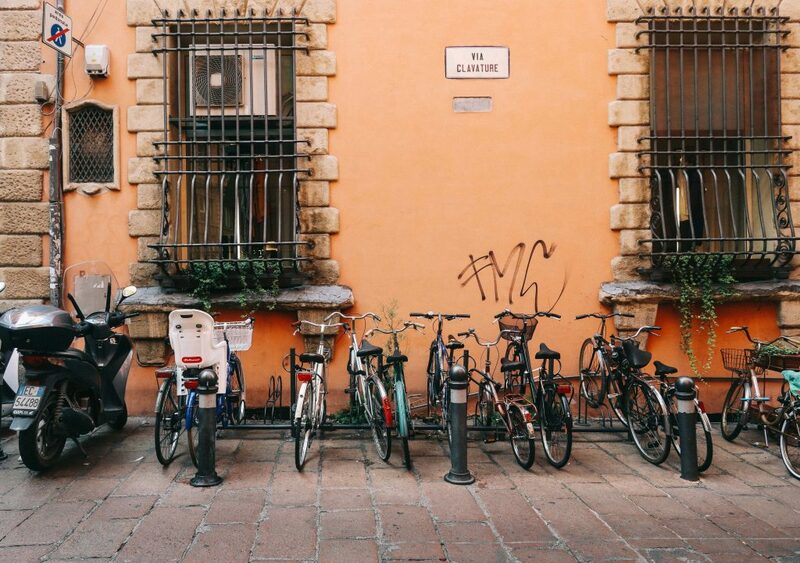 A destination to be savoured slowly – like its infamous ragù dish – Bologna is a city for lazy long lunches, gentle bike rides and, when the mood takes you, a little history. 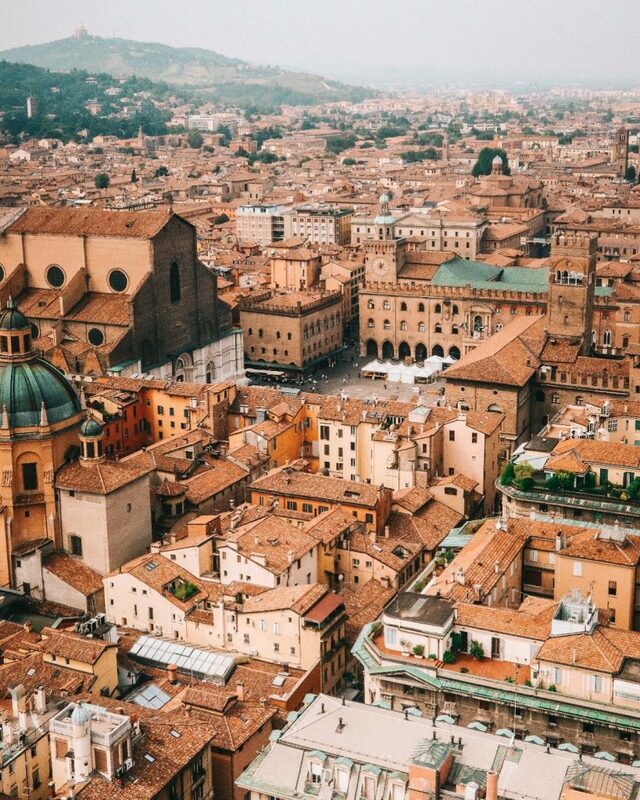 As with most of Italy’s cities, Bologna is just a short two hour flight from the UK. Budget airlines including Ryannair (from London Stansted) and EasyJet (from London Gatwick) offer daily flights to the city, as well as British Airways. For those looking to visit multiple Italian cities, Bologna’s central train station is a major transport hub, offering regular trains to other famed Italian tourist spots, including Florence, Venice and Rome. It also serves the smaller nearby towns of Modena, Ravenna and Parma, for those planning a local day trip. When researching things to do in Bologna, please be rest assured that the city is small enough to explore by foot. In fact, the only time I opted to use public transport was to and from the airport. The airport bus (Aerobus) runs every 11 minutes and offers multiple stops before ending at the central train station. For those looking to glide around the city on two wheels, there are also multiple bike rental options (the city is particularly bike friendly due to its bustling student population). The Bologna Welcome Tourist Office is located handily in the central square, Piazza Maggiore, and is an extremely helpful resource – offering additional recommendations on what to do in Bologna. Here, you can also pick up the Bologna Welcome Card, which offers 48 or 72 hour access to most of the city’s attractions, for just €20-30. This is a guaranteed money-saver for those intending to visit multiple museums, galleries and attractions, and something to be factored in when exploring Bologna’s sights. I booked an incredibly spacious and central Airbnb apartment for my stay in Bologna. Costing £245 for three nights, this was a more than reasonably priced stay for an Italian city break. Piazza Maggiore was located just a few minutes walk away and a cafe sat below the apartment, making it the ideal breakfast spot for an indulgent pastry and espresso. For those adverse to apartment rentals, there are, of course, plenty of wider hotels to choose from (you can browse them here). Home to the world’s oldest university, Bologna is well known for its erudite personality, earning itself the nickname ‘the learned one’. 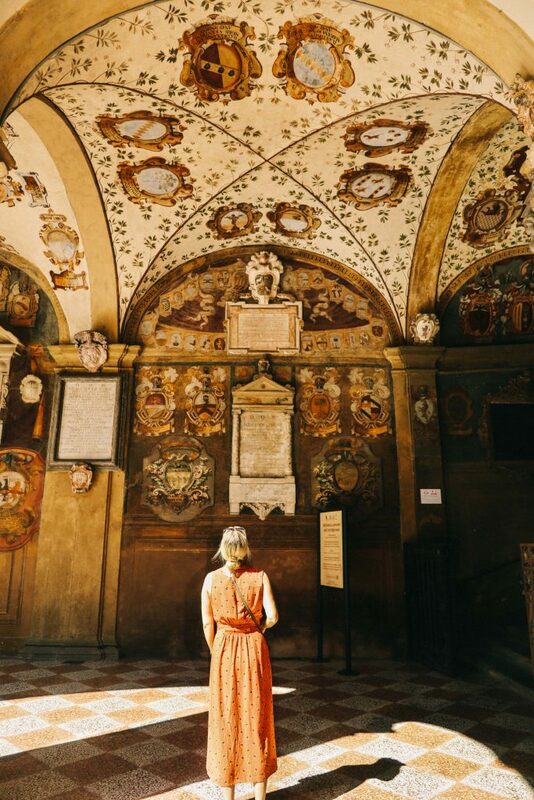 Founded in 1088, the University of Bologna began life as a school of jurists (law), before being joined by medicine, philosophy, maths, astronomy, logic, grammar and rhetoric scholars. With notable alumni such as Dante and Thomas Becket, this is a University steeped in a rich and fascinating history. As an Oxford graduate, I felt an immediate affinity to ‘La Dotta’: a city overflowing with bikes, books, coffee shops and libraries. 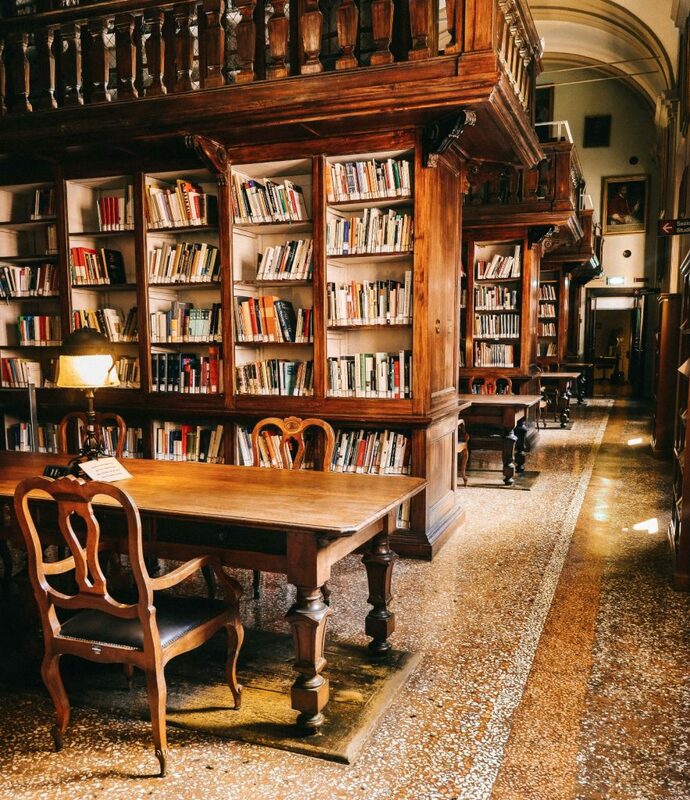 Indeed, for any other budding bibliophiles, this part of the city should be top of your list when deciding what to see in Bologna. Below is just a small selection of the highlights of Bologna’s academic past. Three university museums and the original library are housed within Palazzo Poggi. As a library lover, with access to Oxford’s Duke Humfrey’s during my own studies, it was the prized library of Palazzao Poggi that I had come to visit. Following our guide – a local student – we climbed a few unassuming stone stairs before rounding the corner into an unexpected library dream. Glowing lamps cast a soft glow across the ceiling high bookcases that lined the library walls. Home to 1,250,000 volumes of work and 400 portraits, Bologna’s University Library is like no other. No longer used for study, the library auditorium was now a serene, deliciously dusty-smelling haven, which truly brought to life Bologna’s prestigious academic past. As we were (reluctantly) leaving, I made a mental note to let J.K Rowling know that I’d found a new location for her Harry Potter library, should a new book ever come exploding from her mind. The University Museums also make for an interesting stop, just a few doors down from the library. The Museo di Palazzo Poggi was particularly weird and wonderful, with waxworks used for medical teachings housed next to the original natural history collection of exotic animals. The Observatory Museum also offers a guided tour of Bologna’s first tower used for scientific purposes. Unfortunately, this was closed on the Saturday we visited but is open Tuesday – Friday during set times. Located over two sites in the city – Piazze San Domenico and San Francesco – the ‘glossators’, or legal scholars, lay in impressive, green tiled tombs. Deriving their name from the term used to describe attaching annotations to law texts, the glossators were the original scholars of the University. Wandering passed each tomb, their importance evidenced by their lavish surroundings, it was clear that Bologna is a city inherently wedded to its rich academic past. Stumbling across this spot on our final morning in Bologna, I gazed upwards at the intricately painted palace (Palazzo dell’ Archiginnasio) that houses the infamous Teatro Anatomico. Carved from cedar wood, this former medical lecture hall was an unexpected hidden gem of this city, and one of Bologna’s most popular attractions. Built in 1637, the theatre was once used for anatomy lectures and public dissections. Watched over by a priest to ensure that the dissections were not religiously compromising, this is a particularly haunting spot to visit; the marble dissection slab still taking centre stage in the middle of the room. Bologna’s nickname of ‘the red one’, is said to have been acquired for two very different reasons. La Rossa is firstly said to be a nod to the city’s rich political past; the city reigning as an anti-fascist capital during World War II. Wander through its streets and anti-establishment graffiti and street art can still be found, the student population continuing to keep the protest culture alive. 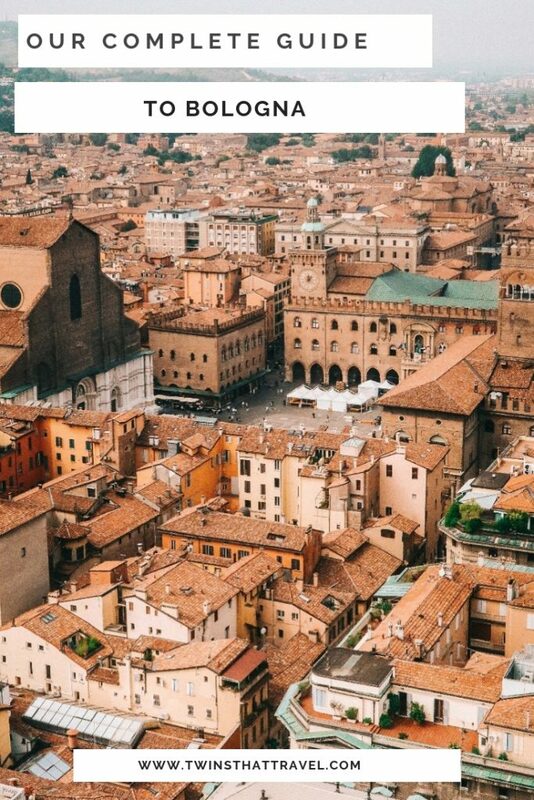 Today, however, ‘the red one’ is used more frequently to describe Bologna’s red terracotta roofs and flaming orange walls that cast its streets in a rich, warm light. 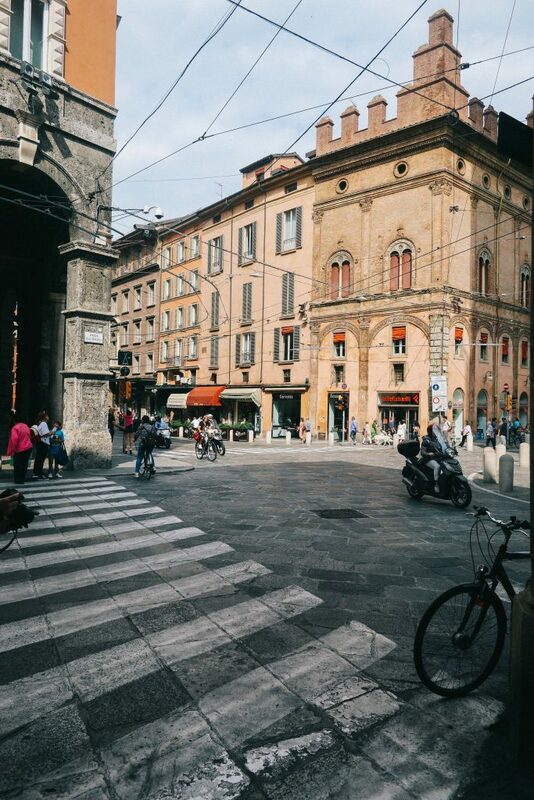 Indeed, aesthetically, the city is a pleasure to explore – the orange and red brick used to build Bologna’s many towers and churches making for a readymade filmset. Strolling through the city, with no particular destination in mind, is perhaps the best way to experience this beautiful city. 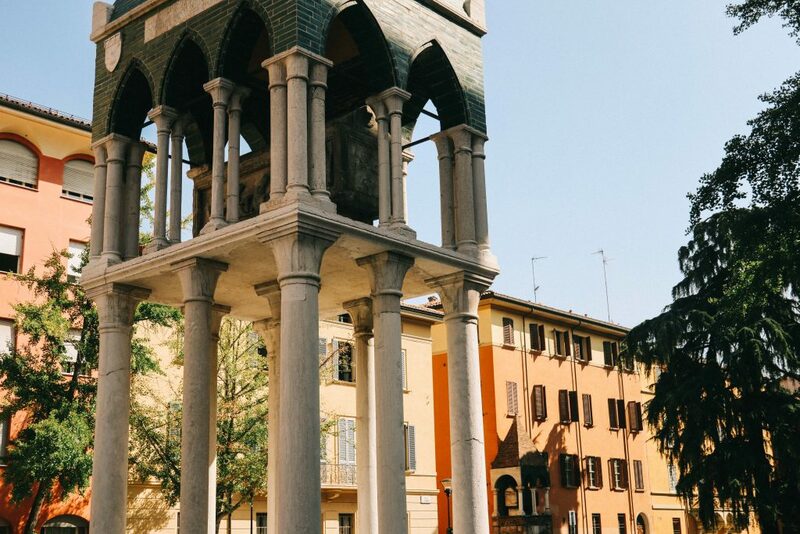 Below are just a few of the city’s architectural highlights, each of which should be added to any list of ‘what to see in Bologna’. 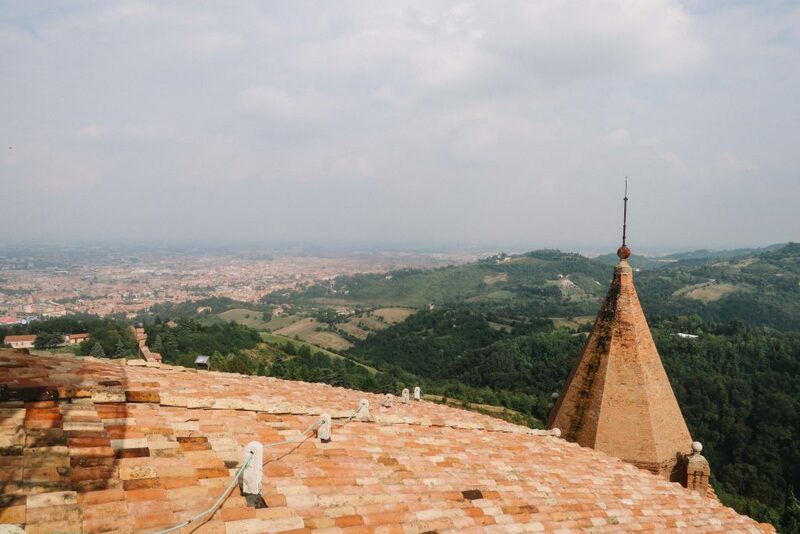 Just under 500 steps high, the city’s Asinelli Tower provides panoramic views out over the city’s sea of terracotta roofs, and is one of Bologna’s most famous sights. Having made it my unwritten rule to always seek out a church or clock tower when in Italy, I had set aside the climb of the Tower for the morning of my birthday. Now sweating and slightly out of breath, I gazed out across the city: a miniature Florence greeting me. To my right sat Bologna’s second tower, Garisenda, now sadly too wonky to be climbed. It’s said that between the 12th and 13th Century, there were up to 180 towers crowding this city. Italy’s very own Manhattan (this name now stolen by Tuscany’s San Gimignano), the towers were thought to be built by wealthy families in an attempted display of success. Only 20 towers now remain in Bologna; including the Garisenda and Asenelli, which are known as the Le Due Torri or ‘the two towers’. Tip: You’ll need to buy a ticket from the tourist office, situated in Piazzo Maggiore before climbing the tower – entry is every half an hour. Given that the Tower tops many lists of what to see in Bologna, it’s also worth arriving early. “This is my favourite portico,” I declared, gazing up at the large overarching ceiling that was protecting me from the midday sun. It was two hours into my first day in the city and little did I know that there were a further 40km of porticoes to explore – each as beautiful as the next. My declaration coming a little prematurely, the majority of my weekend in Bologna was dedicated to exploring these ancient archways. 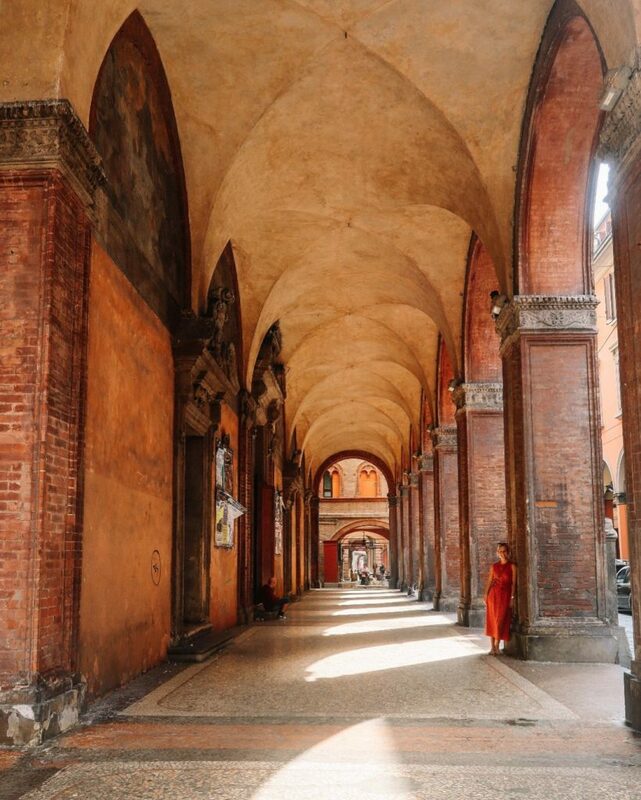 A unique design feature of the city, Bologna is awash with porticoes, the steep archways lining every street. Fascinated by their purpose, I listened intently to my audio guide. Aside from providing room to build accommodation above, with room to trade below, my favourite reason for the porticoes unique design lay elsewhere. Keen to stay dry and clean whilst travelling through the city by horseback, noblemen used the porticoes as protection from the elements. Yet to provide this protection, the porticoes needed to be tall enough to house their towering top hats, all whilst atop a horse. The result? Towering archways. Although no longer used for noblemen and their horses (a crying shame if you ask me), the porticoes are an incredibly useful tool for protecting you from Bologna’s more inclement weather. Explore the porticoes at sunset to see them in their true glory; the sunlight casting pillars of light through their archways. Tip: there are only a few original wooden porticoes remaining, after a local law was passed in 1567 to ban them due to fire risk. To see the original wooden structures, take a stroll to Portico di Palazzo Grassi, which still retains the dark wooden pillars. It is by far one of the most beautiful spots in Bologna. “When I see the Sanctuary of Madonna, I know I’m nearly home,” a local said, mopping sweat from his brow after his weekly power walk up to the hilltop church. Gazing up at its deep orange walls, I considered what I used to identify my proximity to my hometown, Milton Keynes. At a push, it was a few high rise flats found shortly after the Luton turnoff. Pushing this depressing thought aside, we continued our climb up the spiralling stairs that lead to the Church’s terrace, with panoramic views over Bologna below. 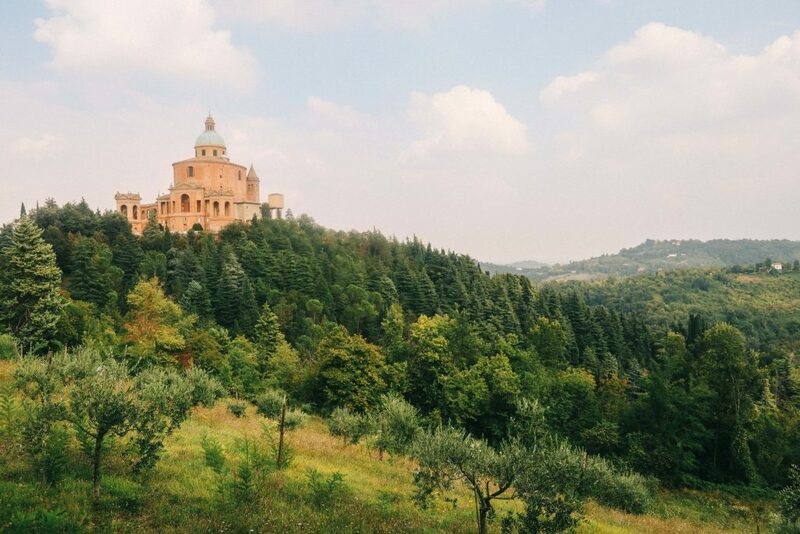 Nestled within the deep green rolling hills of the surrounding countryside, The Sanctuary of Madonna di San Luca is a place for contemplation, quiet and rest, and definitely a spot to consider when planning what to see in Bologna. A pilgrimage destination for thousands each year, the church sits 300m above sea level and is located 2.5km from the city centre. Connected by the world’s longest portico – a whopping 666 arches long – this is a destination that requires stamina. Somewhat ashamedly, I must admit that we opted to take the San Luca Express – a tourist train that leaves the city’s Piazza Maggiore to visit the Church. Although slightly gimmicky in its miniature design, the audio commentary going to and from the church is extremely interesting and ultimately saved us time (and our leg muscles). One of Bologna’s most popular sites, I’d recommend catching the train up to the Church (or the number 20 bus), before returning by foot: a downhill and altogether less sweaty journey. No Italian city would be complete without towering medieval churches, and Bologna is no different. Indeed, the city would have had the tallest Basilica in Italy, were it not for Pope Pius IV, who halted the building of the giant Basilica of San Petronio. When planning what to see in Bologna, its churches must definitely be top of your list. Located in the main Piazza Maggiore, San Petronio houses the largest sundial in the world, yet is still technically classed as incomplete. Despite the architects’ dream that the Basilica would trump Rome’s St Peter’s, Pius IV blocked its construction in 1561, in order to build a new university on the Basilica’s site. Another notable church in Bologna is Basilica di Santo Stefano, located in the city’s prettiest piazza, Santo Stefano. 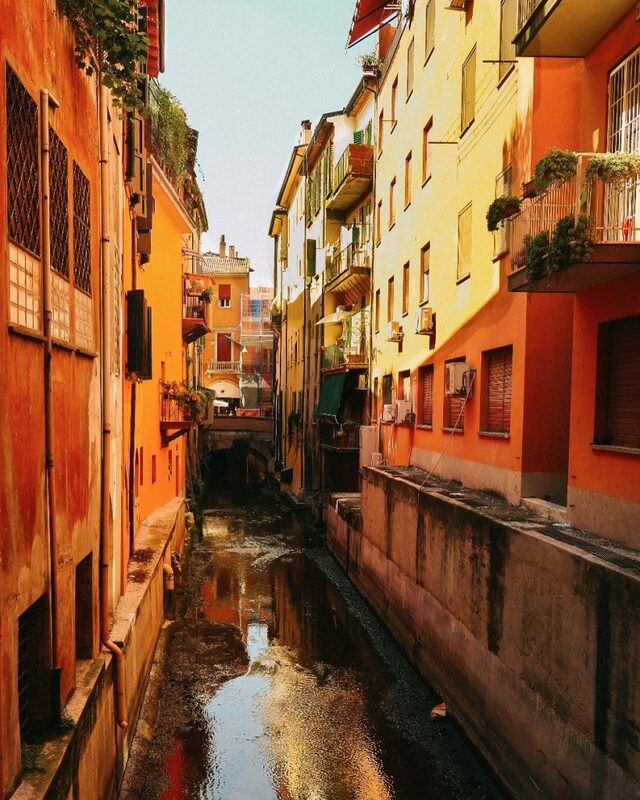 Prior to visiting Bologna, a particular scene from the city would flash up regularly on my Instagram feed. The image – that I mistakingly took to be Venice – depicted a flowing canal flanked by colourful houses. Perplexed as I walked Bologna’s streets, not a canal in sight, I stopped to do some research. ‘Discover Bologna’s Hidden Canals,’ was the title of the first article that I stumbled across. The result was a mild canal obsession, that dominated the remainder of my trip. Thanks to the handy article, I discovered that the majority of Bologna’s thriving canal network was sadly filled in over two centuries ago. Yet with some still remaining, these canals form one of the most beautiful parts of Bologna; and is an area certainly worth exploring. Dutifully following my map, I arrived at my first stop, which confusingly appeared to be yet another orange wall on Via Piella. Initially mistaking a small crowd as a queue for a neighbouring restaurant, I ventured closer. Here – and much to my delight – I discovered that the group were in fact looking excitedly through a small window. Reading the plaque next to it, it transpired that this recently ‘unbricked’ medieval peephole provided a tantalising glimpse into Bologna’s canal past. Peering through, an altogether different city opened up before me. 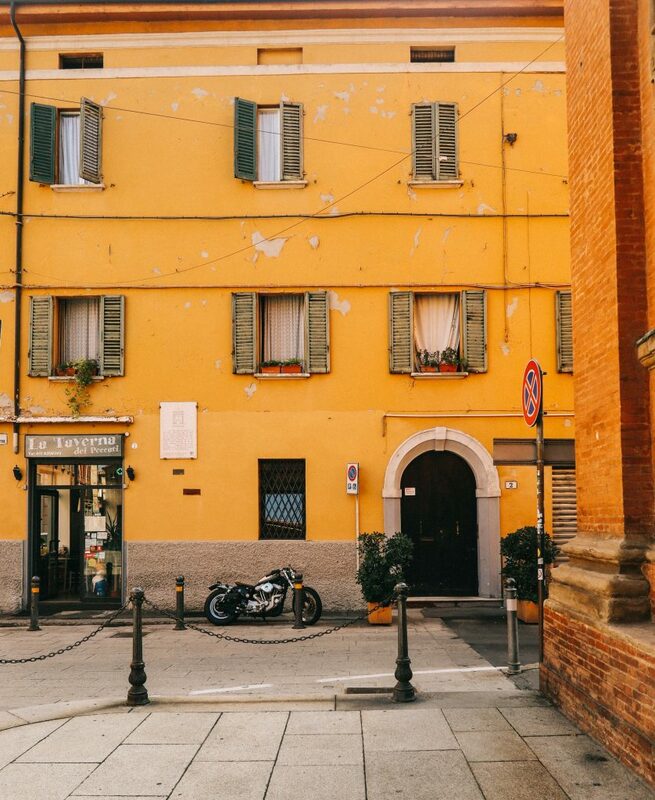 The sun reflecting off the yellow, orange and green buildings that lined the canal, the window offered a gateway into the Bologna that had thrived three centuries ago. When wondering what to see in Bologna, let the canals be it. Nicknamed ‘the fat one,’ Bologna is Italy’s culinary capital. Having spent my twenties studiously refining my tastebuds so that I might enjoy Tuscan reds, aged cheese, cured spicy sausages and smooth balsamic vinegars, I had entered my thirties confident in my ability to appreciate all that Bologna had to offer. In fact, worry less about what to see in Bologna, and instead concentrate on what to eat in this delicious city. A small selection of my favourite spots are listed below, although this is a place where finding a delicious dinner isn’t difficult. 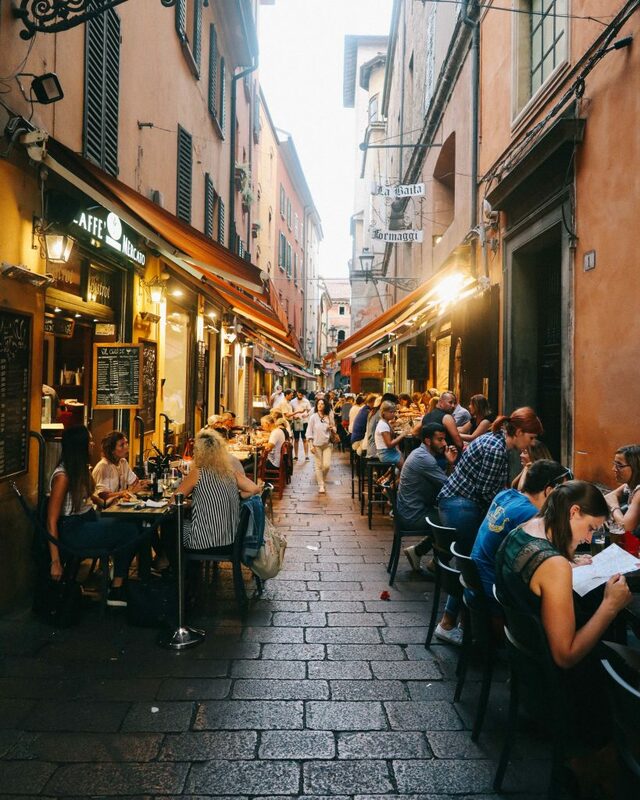 In fact, your only challenge when visiting Bologna will be working out how to squeeze all of the city’s many dining options in. Before I begin with my recommendations, however, it’s important to firstly address an important Bolognese myth. Contrary to popular belief, and despite its name, Bologna is not home to the British favourite: spaghetti bolognese. In fact, ask for this dish in a restaurant in Bologna and heads may roll. The traditional dish of this Emilia- Romagna region is in fact the meat focused recipe of ragù. Steaming piles of fresh tagliatelle (not the wheat based spaghetti found in southern Italy) are layered with slow cooked mince, onion, pancetta, carrots and lashings of milk and wine. This recipe results in an altogether different dish, focused less on that distinctly acidic sauce, and more on the quality of the meat. When planning things to do in Bologna, finding what you believe to be a traditional ‘bolognese’ is therefore perhaps something to scratch off your list. Owing this find entirely to my Lonely Planet guide, Osteria dell’ Orsa was the dining highlight of my trip. Selecting it as my chosen location for my birthday lunch, Osteria dell’ Orsa offers €10 plates of ragù, washed down with €3 glasses of wine or beer. What more could you want from a birthday lunch? Incredibly popular with locals and students, this little Osteria is a bustling, foodie haven. Despite its famed ragù and cured meat offerings, Bologna needn’t be off limits to vegetarians or vegans. Eager to give our digestive systems a break from our cheese and meat based diet, we went in search of a lighter meal. Located just off Piazza Maggiore, Botanica Lab is a plant based haven, offering delicious vegan dishes. Well and truly in ragù territory, this restaurant stands its ground with equally satisfying and locally sourced dishes. The cream of cashew ricotta and vegan brownie are particular highlights. Using Instagram to help me decide what to see in Bologna, I hastily sent a request into the social media vortex. Amongst the extremely helpful suggestions that came back, one particular suggestion caught my attention. ‘Burgers and Gin and Tonic!’, the message read, with a link to the restaurant, Conta. Scrolling through the rave reviews, I decided to opt for this alternative recommendation. I didn’t regret it. This is a fun and uniquely delicious restaurant, boasting creative dishes and drinks (the balsamic infused gin with pomegranates a must). With the sun setting, the lamps lining the narrow medieval streets flickered on as we strolled the passageways of the city’s Quadrilatero. 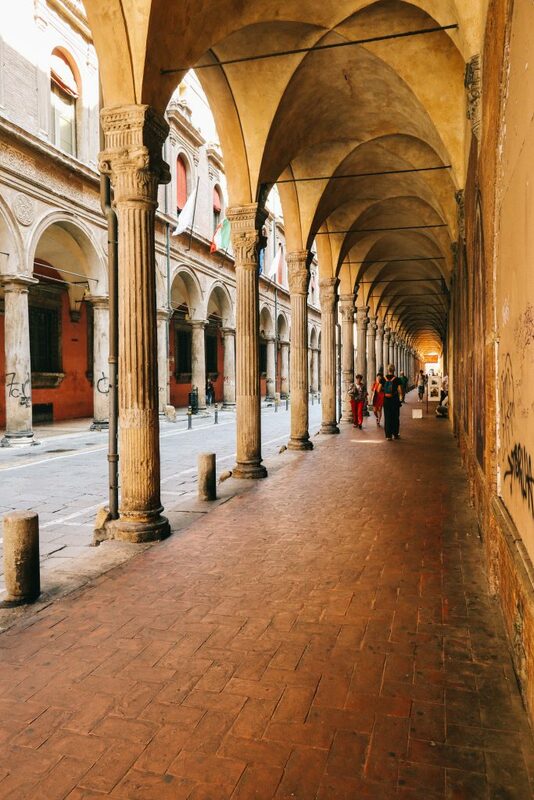 These small alleyways, which lead from the Piazza Maggiore, form the epicentre of the foodie scene in Bologna. Teeming with people from morning to night, this is the ideal place to come for an apertif before dinner, or to stock up on the highest quality meat and cheese products. For real foodies looking to immerse themselves in the region’s culinary delights, there are a number of food tours available in and around the city. These can be booked via the city’s tourist information office. 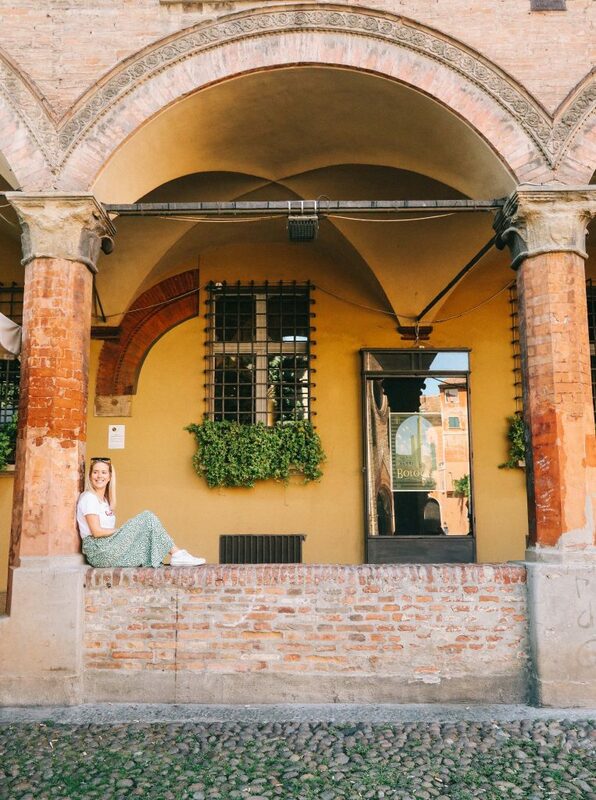 Often overlooked for the romantic canals of Venice, or the sprawling gardens of Florence, Bologna is a city that can fly under the tourism radar. Yet, a place boasting three complex identities, towering porticoes, culinary delights and the world’s oldest university, this beautiful city is surely one that demands attention. 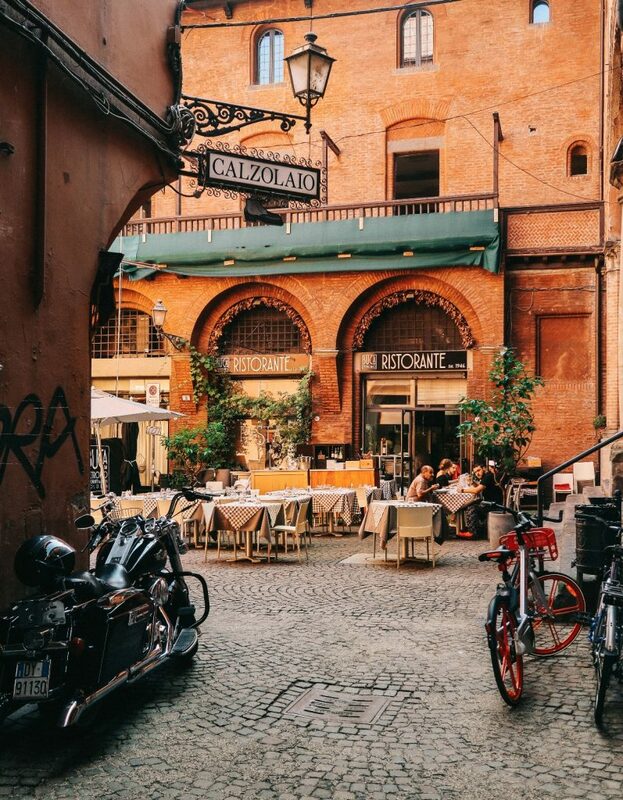 Laid back, friendly and more accessible than some of its neighbours, Bologna is a place to be enjoyed at a slow and relaxed pace. Despite still possessing an extensive list of things to see in Bologna, this is a city I’ll return to simply when I’m in need of some warming food, gentle strolls and a dose of inspiring history. We hope that this guide on what to do in Bologna was helpful. If you have any other suggestions on other fantastic things to see in Bologna, please feel free to let us know below. Staying in Europe for longer? Why not read our guide to the ultimate two weeks in Europe, or suggestions for alternative European city breaks. Haha, yes let’s be honest here. I’m so excited you recommended a vegan place! I’m a vegetarian and was a bit worried about how I’d find it eating out there, it’s definitely on the list now.